The leader of Islamic State in Afghanistan has been killed in a joint raid in eastern Nangarhar province, Afghan and U.S. military officials confirmed Sunday. “Sheikh Abdul Hasib, the Emir of Islamic State of Iraq and the Levant – Khorasan Province (ISIS-K) in Afghanistan, was killed in a combined Afghan/U.S. raid,” the U.S. military said. Dozens of Afghan and American special forces killed Sheikh Abdul Hasib along with his 35 fighters in a combined operation against an IS cave and tunnel complex in the Achin district, the statement added. Other high-ranking IS leaders also are said to have been killed in the April 27 operation. Hasib was appointed last year following the death of his predecessor, Hafiz Saeed Khan – a former Pakistani Taliban commander – in a U.S. drone strike in the same Afghan province. The U.S. military often refers to the terror group as ISIS-K. Commander of U.S. Forces in Afghanistan General John Nicholson praised the successful joint operation as another important step in the relentless campaign to defeat IS in the country in 2017. “This is the second ISIS-K emir [leader] we have killed in nine months, along with dozens of their leaders and hundreds of their fighters, Nicholson noted. 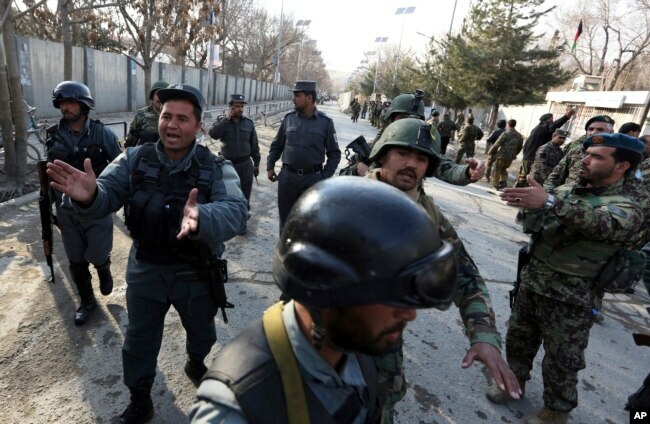 Hasib was the mastermind behind a deadly attack against a military hospital in Kabul on March 8 that killed more than 30 people and injured 80 others, the Afghan Presidential Palace said in a statement. “The ISIS leader directed the attack on the Sardar Mohammad Daoud Khan hospital which resulted in the death and injury of several of our fellow citizens,” the palace statement said. U.S. officials said the slain IS chief also directed fighters to behead local elders in front of their families and ordered the kidnapping of women and girls to forcibly marry them off to his fighters. “For more than two years, ISIS-K has waged a barbaric campaign of death, torture and violence against the Afghan people, especially those in eastern Nangarhar, noted General Nicholson. ”Any ISIS member that comes to Afghanistan will meet the same fate,” he vowed. U.S. and Afghan troops had been involved in an “intense” 3-hour firefight that also killed two American forces, said a joint statement released after the operation. A counter-IS operation has been under way in Nangarhar since early March, and Afghan forces, with the help of their U.S. counterparts, have killed or captured hundreds of fighters and liberated over half of the districts the terror group controlled in the province, according to the U.S. military. Last month, the U.S. Air Force dropped “the mother of all bombs” on IS-K’s stronghold in Achin district, killing at least 95 IS militants, mostly foreign fighters.